Growing up, my dad would regularly make cinnamon rolls for the family on weekends, and it was awesome. His cinnamon rolls were super easy to make: prepare the recipe for Bisquick biscuits found on the box, roll out the dough into a rectangle, apply a thin layer of butter across the dough, spread brown sugar on top leaving about a half inch of dough around the edges, shake some ground cinnamon on top, roll it up, cut it into one-inch pieces, then bake per the biscuit recipe. They are very quick to prepare with no real measuring of ingredients, probably 30 minutes start-to-finish. I made these myself for a number of years, but I started searching for a made-from-scratch recipe to see if there was a way to make them better. Well, this is that recipe. It takes a little bit longer than the Bisquick version, but it is totally worth it. Sometimes I add a teaspoon or two of ground cinnamon to the dough to give it a little more spice, and I usually do not prepare any frosting but that is definitely a possibility. These are great for a lazy Sunday morning when you just want to relax and watch some TV with a little coffee. I actually prefer no-yeast cinnamon rolls to yeast-based cinnamon rolls. Beyond my taste preference, it just takes too long to prepare the yeast recipes, waiting for the dough to rise potentially multiple times. You really have to plan in advance if you want to eat them, and, most of the time, I wake up and want cinnamon rolls now. Preheat oven to 425 degrees. Combine filling ingredients in a small bowl, then mix until well blended. Set aside. In a large bowl, whisk flour, sugar, baking powder, baking soda, salt, and cinnamon. In a separate bowl, combine buttermilk and 4 tablespoons butter. Pour buttermilk mixture into the dry ingredients. Kneed gently by hand until the dough forms into a ball. On a lightly floured surface, roll out the dough into a 1/8-1/4″-thick rectangle. Spread the filling mixture across the dough, leaving about 1/4″ of space on each side. Roll the dough along the short edge (my preference) or long edge. Cut into 1″ pieces and carefully place onto a baking sheet covered with aluminum foil, leaving an inch or two between each cinnamon roll. 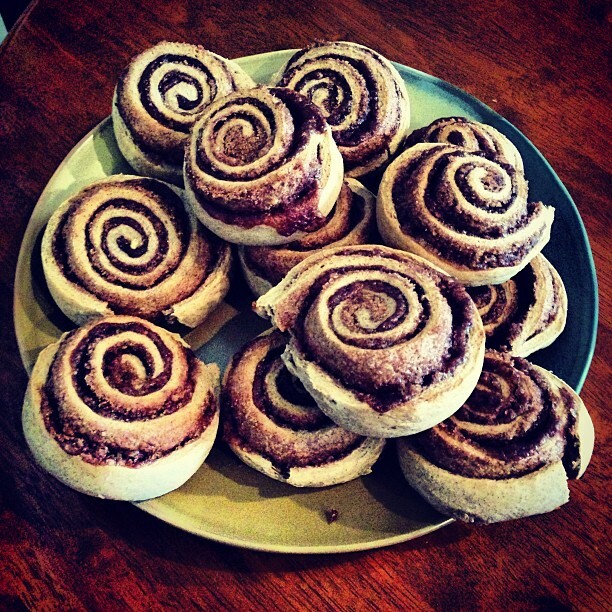 Brush cinnamon rolls with remaining tablespoon of butter, then bake for 15 minutes or until tops are golden brown.